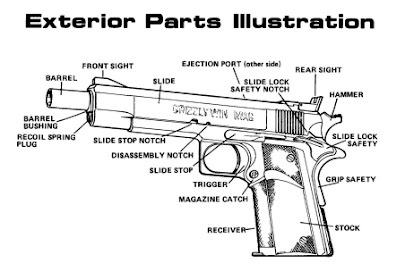 Here are a couple of quick reference diagrams for Grizzly pistols (click on them to enlarge). As you will see they are basically a Model 1911 in every way... just some of the pieces have been stretched and/or beefed-up to handle the size and recoil of larger magnum calibers. I will try to get some better scans of these in the near future. Please note the link in our "links" section to the right. 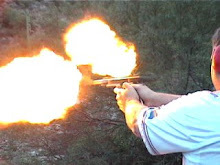 This will take you directly to a downloadable version of the entire Grizzly Hangun Owner's Manual. 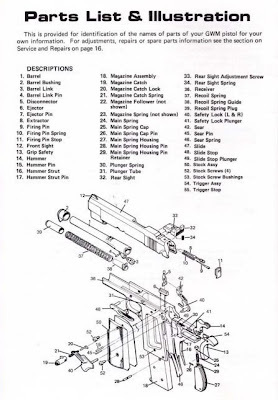 We are looking for the list that Grizzly once put out showing which parts were standard 1911 and which ones were different... if anyone has one... please scan at decent resolution and send to me at: cam2@towerprinting.com. The catch assembly fell apart on my 45 Win Mag. Basically the entire unit came out on the right side. I noticed that there is a slot in the frame that, I assume keeps the catch unit within the frame, but am not sure. My guess is that something disintegrated on me and that is why it fell out. Can someone share with me if it is just a matter of purchasing a replacement catch system, or do I need to get the help from a gunsmith? These parts are standard 1911 GI. SARCO INC is a good source.